MISCELLANEOUS - new additional features like IE cookies explorer, cache explorer, favorites and typed URLs viewer, etc. Available over v1.3. Screenshots are here. To recover Internet Explorer passwords manually you should specify the full path to the NTUSER.DAT registry file. It is located in the user's profile directory (typically C:\Documents And Settings\, where is the name of the user account. Another feature of this program is removing, changing, storing and recovering the password to the Internet Explorer Content Advisor. 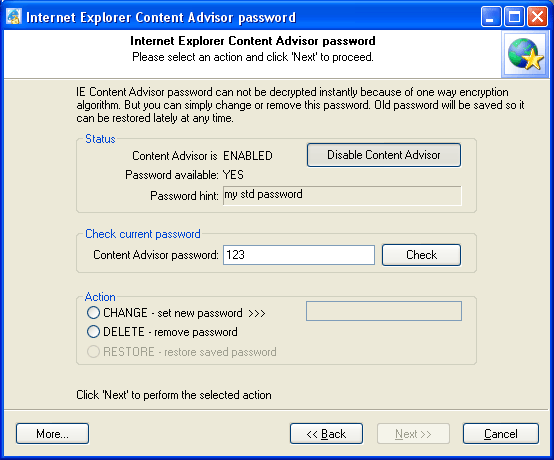 If you lose or forget your Content Advisor password, you will be unable to use Internet Explorer since most websites have no rating at all. 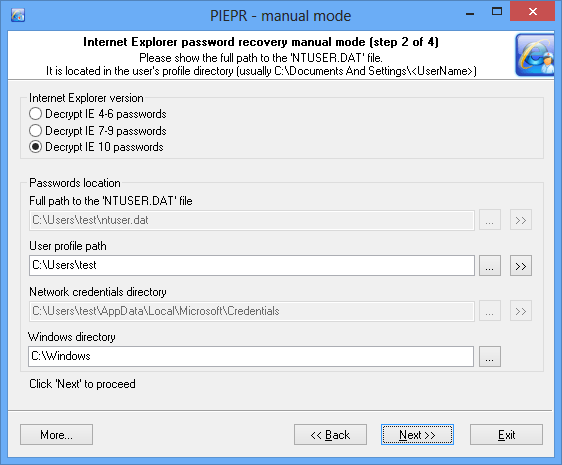 PIEPR solves this problem by removing the password and allowing you to disable the Content Advisor. Select the Content Advisor option in the main window and click the following button to view the IE Content Advisor password dialog box. Sometimes it is required to reveal the password that is hidden behind the ***** edit box. 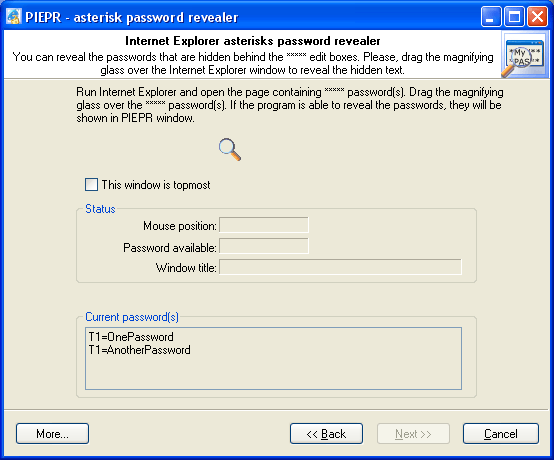 Just open 'Asterisks password revealer' dialog and drag the magnifying glass to the Internet Explorer window. Simple as 1-2-3. Run the program and select ASTERISKS PASSWORDS recovery mode. To reveal the passwords, drag the PIEPR magnifying glass over this Internet Explorer window with password boxes. P.S. Ensure that you view this page with Microsoft Internet Explorer 5 or better. Also please note, that unregistered version of the program shows passwords that are not longer than 3 characters. When you run Internet Explorer and attempt to view a password-protected site, you are prompted to type your security credentials in the Enter Network Password dialog box. If you click the Save this password in your password list check box in this dialog box, your computer saves your password so you do not have to type the password again when you attempt to use the same document. This is known as password caching. 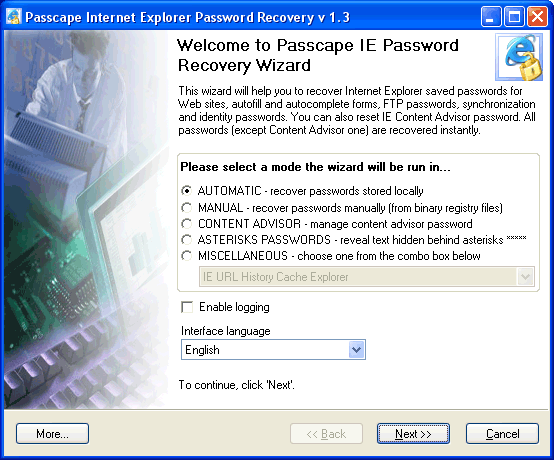 Passcape Internet Explorer Password Recovery v1.1 allows you to enable/disable Internet Explorer password caching (for automatic recovery mode only). Just click 'Disable password caching' button to disable it. The password caching will be disabled and the button text will be changed to ''Enable password caching'. Click again to enable it.